Roughly a decade ago torrent sites ruled the piracy landscape. In recent years, however, the public has started to shift to streaming, through authorized services like Netflix but also streaming pirate sites. Globally, streaming piracy has outgrown torrent sites, many of which still offer pretty much the same deal as ten years ago. While torrents remain an important source for many pirate streams, there has been very little innovation. Yes, some torrent clients have built-in streaming, and Popcorn-Time used to be all the rage, for a while at least. But aside from an occasional flirt with torrent-based streams, big players such as The Pirate Bay stick to torrents. This is something TorrentGalaxy is hoping to change. For those who haven’t heard, TorrentGalaxy is a new torrent site that’s only a few months old. The idea for the site came from ExtraTorrent members and staffers, who were left homeless after it shut down. They were later joined by a number of WWT staffers, with the goal to create a unique torrent site. While there are already dozens of torrent sites out there, TorrentGalaxy hopes to set itself apart by maintaining an active community and experimenting with new features. This includes streaming, something most torrent sites stay clear of. “Torrent sites and their communities feel torrenting is ‘better’ than streaming sites and their followers feel the opposite. To us, that whole premise is wrong. That’s why we came up with the idea to merge streaming into a torrent site,” TorrentGalaxy informs us. Since last week, the site has begun offering more than 1,100 active streams. These are not pulled from a shared database but are automatically uploaded to an external stream provider (e.g. Openload) by the site’s own bots, which also distribute the other [TGx] releases. This means that they are all ‘fresh’. Technically, it’s also possible to offer torrent-based streams in the browser, but the site has chosen a centrally hosted alternative instead. This offers more stability and works even if the torrent has no seeds. “All new SD TV uploads by TGx bots have an online stream available minutes after the torrent is uploaded. This process is fully automated. Later on, we intend to include TV HD and movies as well,” we were told. 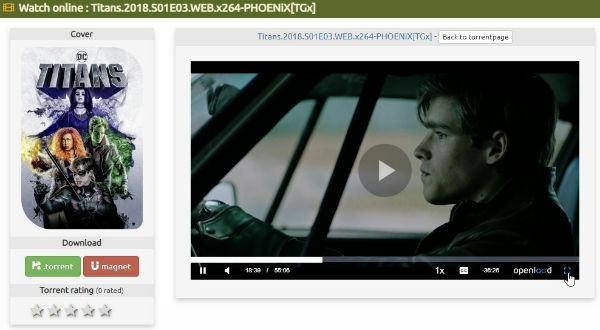 For die-hard torrent users it may be odd to see a streaming video next to a torrent link. While “fake” streaming buttons are a common sight, these ones actually seem to work, without having to jump through hoops. Torrents that have a stream are marked with a separate icon in the torrent listings, and on the detail page, there’s a “click to stream” button that leads visitors to the streaming page. With the demise of several torrent sites, including the criminal investigation of KickassTorrents, it’s clear that operating a torrent site is a severe liability. And users who use them to access infringing content are obviously doing so without permission. Copyright holders, who have grown increasingly worried about streaming sites, are not going to like this development. However, this doesn’t appear to affect the TorrentGalaxy team. Their prime motivation is to move forward. This hasn’t been without controversy either. Just a few weeks ago TGx was called out by ETTV who accused the group of ‘taking’ some of its releases. While the site doesn’t deny that they used scene releases that were distributed by ETTV early on, they say they’ve stopped doing so a long time ago, something our research tends to confirm. Whether the hybrid model will be welcomed by others has yet to be seen. Traditionally there has been quite a bit of competition between torrent and streaming sites, but according to TorrentGalaxy, it’s time to bury the hatchet. Whether users want to use torrents or streams is entirely up to them, TorrentGalaxy says. In some cases, an SD streaming video may be more suited to get a quick glance, while an HD download may be preferred for others. “It should not have to be a one or the other choice. Now that’s the power of a hybrid torrent/streaming site. And I would very much like to see that becoming the standard for all large-scale general piracy sites,” TorrentGalaxy concludes.